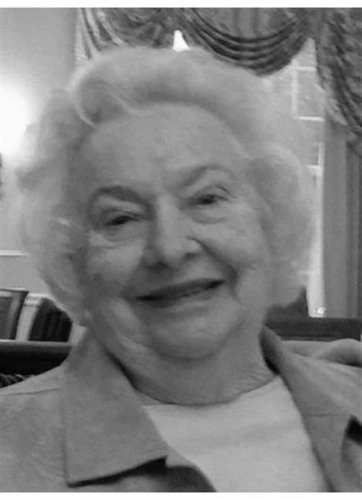 Jocelyn (Dos) Joy Walter, 89, of Peterborough, passed away peacefully on March 21, 2019. She was born in Lynn, Massachusetts on May 3, 1929, the second of three children of Grady Hugh and Muriel (Moody) Salter. Jocelyn was a graduate of English High School in Lynn, MA, and a 1952 graduate of Tufts University. Jocelyn was predeceased by her husband of 52 years, Mark McNinch Walter Jr., MD, a prominent psychiatrist and director of McLean Hospital in Belmont, MA. The happiest years of Jocelyn’s life were in Concord, Massachusetts, where she and Mark raised four children in the Reuben Brown House on Lexington Road. After many dedicated and rewarding years raising her family, Jocelyn worked at the New England Conservatory of Music as Assistant to the Dean, and then at the Massachusetts State Ethics Commission. After retirement, the couple resided in Naples, Florida; Boothbay, Maine; Sharon, New Hampshire; and they enjoyed a summer camp in Wilson’s Mills, Maine, in the heart of trout fishing country. Her husband passed away in 2005, and Jocelyn eventually moved to RiverMead in Peterborough, New Hampshire in 2008. Jocelyn’s greatest interests were opera and sailing. She was the Director of the Metropolitan Opera Auditions for New England and eastern Canada for ten years, where she helped find the next great opera voices. She was an accomplished sailor who loved the ocean, a love she got from her father, Grady. Her sailboat, “Skylark,” brought her many joyful adventures with dear friends off the coast of Maine. Jocelyn loved the wilderness and sea sport-fishing. Outstanding events in her life include catching a 601 pound tuna on a 120 lb test line, her children’s graduations and weddings, and fishing trips to the Rockies and Norway. Jocelyn was predeceased by her husband, her brother, Winfield Owen Salter, and her sister Jacqueline (Salter) Diette. Jocelyn is survived by her children Mark McNinch Walter, III, married to Rachael (Verdile) Walter of Keene, NH; Adam Brewster Walter married to Katie (Ruze) Walter of Golden, CO; John Stuart Walter married to Alicia (Rosen) Walter of Shutesbury, MA; and Victoria Anne (Walter) Plotsky married to Bruce Plotsky of Clarksville, NY. She leaves five beloved grandsons, Philip Mark Walter, Evan Ruze Walter, Riley Jacob Walter, Dylan Francis Walter and Peter Michael Walter. Jocelyn is also survived by nieces and nephews; Dayna Salter, Carrie Campbell, Paul Diette, David Gold, Melanie Diette, and Kim Pinali; as well as many cousins. Calling hours will be held on Tuesday March 26th from 4:00 PM to 6:00 PM at Jellison Funeral Home, 25 Concord Street, Peterborough, NH. A memorial service will be held on Friday, March 29, 2019 at 11:00 AM at the Peterborough Unitarian Universalist Church, 25 Main Street, Peterborough, followed by a celebratory reception at RiverMead, 150 RiverMead Road, Peterborough, NH. Jocelyn loved tigers, and in lieu of flowers, memorial contributions may be made in Jocelyn’s name to www.savetigersnow.org , a campaign of the World Wildlife Fund, 1250 Twenty-Fourth Street, N.W. PO Box 97180 Washington, DC 20090-7180.